INCREASE aims at maximizing the penetration of distributed renewable energy units in the low and medium voltage grid. Keeping the voltage profile within limits is becoming more challenging for DSOs. Therefore we have developed in INCREASE technical solutions that enable the DSO to evolve from congestion manager into capacity manager. The technical solutions focus on the use of active power to control the voltage profile and mitigate voltage unbalance. State-of-the-art solutions which are provided for DRES units on the LV networks focus on primary voltage control, i.e. fast interventions by the DRES units, thus, without active coordination based on inter-unit communica­tion. Therefore, the renewables are now equipped with an on-off controller so they can shut down when a certain voltage is exceeded and turn back on when the voltage drops again below a certain level. Although restarting the unit is mostly delayed (e.g. a 15 minute delay to make an attempt to turn on again), still on-off oscillations of units can occur. Another issue with this method is the large loss of potential renewable energy, as the unit did not have to be turned off entirely to solve the voltage problem. The INCREASE solutions solve these problems. The local control is a fast control using only local parameters (voltage and available power) at the inverter terminals (grid side and renewable source side). This local control is responsible for maintaining the stability of the distribution network and is able to immediately react on disturbances. The control strategy is based on a combination of a voltage based droop control and a voltage unbalance mitigation strategy. Since the R/X ratio in the low voltage distribution grid is high (usually bigger than 3), the reactive power will not be efficient for the voltage control because the inverter in the DRES must inject more than three (in case of R/X equals 3) times higher reactive current in order to have the same effect as the active current. Therefore active power is used for the voltage control. Only local parameters (voltage and power at the point of connection) are used as input for the control strategy. The voltage based droop control reduces the active power infeed using the voltage at the terminals as input. Figure 2 depicts the principle of the voltage based active power droop control. In INCREASE the focus will be on the right-hand side of the figure. If the voltage increases above vg,up, the power will be curtailed linearly. p*DC denotes the power which is available at the dc-terminals of the inverter. where ʋ0, ʋ1, ʋ2 are the zero-, positive- and the negative-sequence grid voltage components, and g1 is the fundamental conductance of the inverter which has an opposite sign of gd in case of generation. The damping conductance gd is chosen so that the voltage unbalance mitigating effect is maximised. The damping conductance can also be chosen as a function of the grid voltage. An example of the injected currents in case of voltage unbalance is depicted in Figure 3. When a phase voltage is low, more current will be injected in that phase as can be seen. The INCREASE local control results in a reliable and stable distribution grid. However, this local control does only take into account local parameters, other grid operational parameters cannot be taken into account. This is thus addressed by adding an extra control, namely the INCREASE overlaying control. The INCREASE overlaying control is schematically depicted in Figure 4. INCREASE proposes to use a multi-agend control system (MAS) to reach an optimal system. Each grid agent can be considered as a software entity that will be embedded in the grid-connected systems (such as inverter, On Load Tap Changers) and is able to autonomously react to changes in that environment. The three functionalities will now be described in more detail. The first control mechanism is a uniform power sharing control that is complementary to the INCREASE Local Control. Voltage control by means of active power curtailment based on local measurements can lead to unevenly distributing the curtailed active power among DRES connected to the same distribution grid feeder. Therefore, the Overlaying Control enables to identify possible unfair power curtailment situations and solve this by sending new set points to the corresponding inverter-connected renewable energy units. The second control mechanism aims to coordinate the operation of an OLTC of the MV/LV transformer with power curtailment of PV inverter to cope with voltage violations. This enables us to solve possible voltage regulation conflicts between different feeders and to maximize the renewable energy production by only curtailing when changing the tap setting is no longer possible. The third control mechanism is used for congestion management of the MV/LV transformer. The proposed control mechanism aims to distribute the required curtailment to relieve the congestion among all the connection points on the basis of a fair power curtailment mechanism. In order for the DSO to evolve from congestion manager to capacity manager, a service layer is required as depicted in Figure 5. This service layer comprises the scheduling control. ii. Maximize the profit of DR units. iv. Internal DR unit energy price. For real time operation of DR units, a “traffic light system” approach is used that enables the DSO to approve or block the proposed DR schedules. The traffic light system employs three different modes of operational control, which differ by complexity of control and information required for its operation. 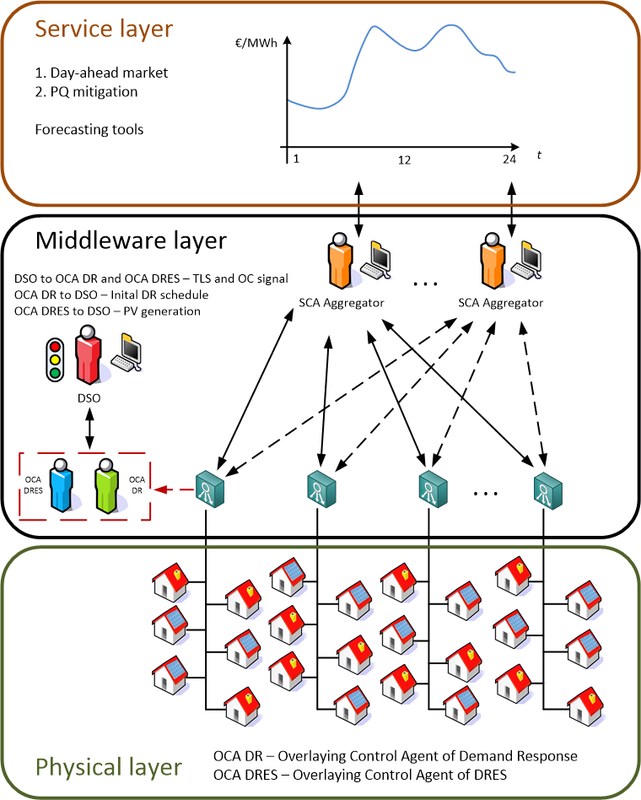 A general overview of scheduling control concepts is presented in Figure 5. One of the main aims of INCREASE is to investigate which new ancillary services (AS) could be provided by the technical solutions of INCREASE, which business models could emerge and which (new) actors may be involved. There are several definitions of ancillary services. The ENTSO-E for example refers to AS as a range of functions which TSOs contract so that they can guarantee system security. These include frequency control (using several layers of active power reserve to maintain system frequency); control of voltage and reactive power; black start capability (the ability to restart a grid following a blackout) and various other services. The four key grid services in INCREASE, tackled by the developed INCREASE solutions, are Voltage Control, Voltage Unbalance Mitigation, Current Congestion Management and provision of active power reserve. They are the aim of the four new AS proposed in INCREASE: Basic Service, Scheduling Service, Balancing Service and TLS service. The first service we assessed is the Basic Service. It entails provision of voltage control, voltage unbalance mitigation and current congestion mitigation by the Local and Overlaying Control strategies. It requires upgrading the existing classical inverters, or installation of new advanced inverters if also VUM is desired. The second service assessed, the Scheduling Service, envisions also the participation of Scheduling Control in addition to LC and OC. The aim of Scheduling Service is tackling of all four key grid challenges (VC, VUM, CC and Reserve Provision) by appropriately scheduling of Demand Response. The last assessed service was called TLS service. In the INCREASE solution with the SC in place, the Traffic Light System (TLS) ensures that the additional PQ violations don’t arise due to the DR schedules, allowing the DSO to maintain the secure operation of the grid. This service assessed the effects of using different Traffic Light Systems, moving from a Simple TLS on to an Advanced TLS and then to the Intelligent TLS. The key to the provision of the AS envisioned in INCREASE are the actors: the potential market players and the beneficiaries of AS – those providing and those using the AS. To analyse the value of the AS provided, a Value Analysis Methodology was developed as shown in Figure 6. It starts with the Technical Analysis where MAS control strategy operation is simulated using the integrated simulation platform through Evaluation Scenarios in a typical distribution network. These scenarios cover the problem space in which MAS control operates, reflecting different operating stages of LV networks, e.g. with different penetrations rates of DRES and Demand Response (DR) or different seasons. The simulated outcomes of the MAS control strategies provide operating schedules of DRES- and DR-units and thus the ‘physical value’ of the AS provided by the INCREASE solutions. The fundamental data structure that contains the key framework parameters for both the Technical Analysis and the Value Analysis Scenarios is the Framework Matrix. It contains technical, market, economic and regulatory boundary conditions specific to the national power system of a country. The Framework Matrix provides the key inputs to the Value Analysis together with the Business cases that connect the actors with the market mechanisms, the market designs and assign them the roles. The economic, environmental and operation security value that the results of the MAS Evaluation Scenarios provide to the actors in the chosen Business cases is then assessed with the second tool, the Value Analysis Tool (VAT) using AS Value Analysis scenarios. These scenarios comprise a series of parameters that describe the assumptions used in the Value Analysis. Appropriate criteria and metrics including key performance indicators (KPIs) have been built into the VAT to quantify the value created via INCREASE solutions. The results of the Value Analysis are provided through the assessment of Value Analysis scenarios. The assumptions for a typical power system are structured in the Framework Matrix (e.g. electricity prices, costs of INCREASE technologies, external costs for emissions). For a chosen national power system, the Framework Matrix is filled with typical parameters in order to demonstrate the entire analysis methodology. The Value Analysis Methodology will support the investigation of AS market designs and their appropriateness for the four key INCREASE AS. Through proposed Business cases for the selected AS, new values can be created for various market actors (existing and new). Appropriate criteria and metrics including key performance indicators (KPIs) are used to assess this value.